Apologies in advance, this post is a tad World Cup heavy. Two years ago, along with my friend Tim, I sought out some of the best spots in London to watch various nations play during the Euros in 2012. The overwhelming winner was Estrela Bar in Stockwell on the stretch of road known as Little Portugal. But now Brazil & co have joined the party, there are some new contenders. P.S. It's not all football, there's also Bea Vo's new diner, a bar in a toilet, and a distillery serving cocktails in Bermondsey. Enjoy! Friday 13th June - For the European final in 2012, we foolishly sided with Italy against Spain, setting up camp in Bar Italia for the day. The atmosphere was great, faces were painted, Peronis were drained etc etc, but Italy got thumped 4-0. I wasn't going to make the same mistake twice, so for Spain's opening match against Holland, I decided to hang out in Bradley's Spanish Bar rather than brave the Dutch crowds in De Hems. Bradley's is tucked away down a side street in Tottenham Court Road, and has a lovely European feel to it. 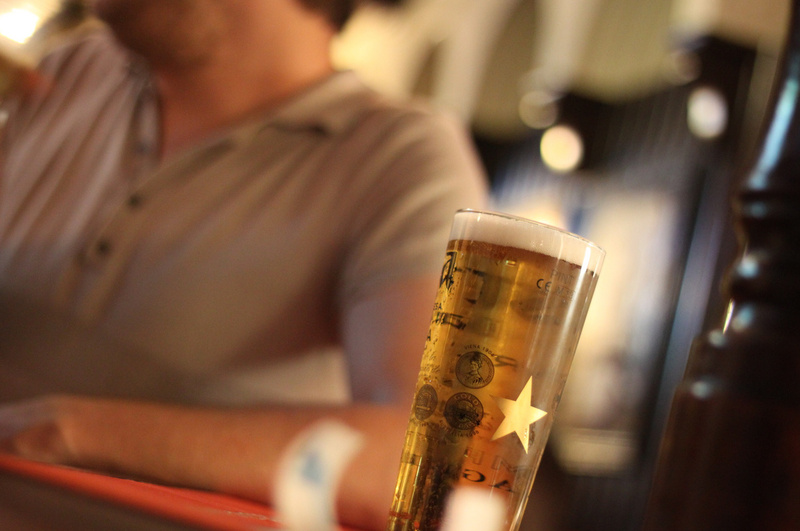 The jukebox keeps people entertained whilst they sip on Estrella, San Miguel, Cruzcampo & Mahou (it's high time some good Spanish beers started appearing). The bar filled up to capacity, though not with as many rowdy Spaniards as I had hoped, and we watched as Spain comfortably took the lead. So far, so good. Then Robin Van Persie did his salmon impression, Casillas had a nightmare and they ended up losing 5-1! I think I might be cursed. We promptly ran away and went in search of late night food. 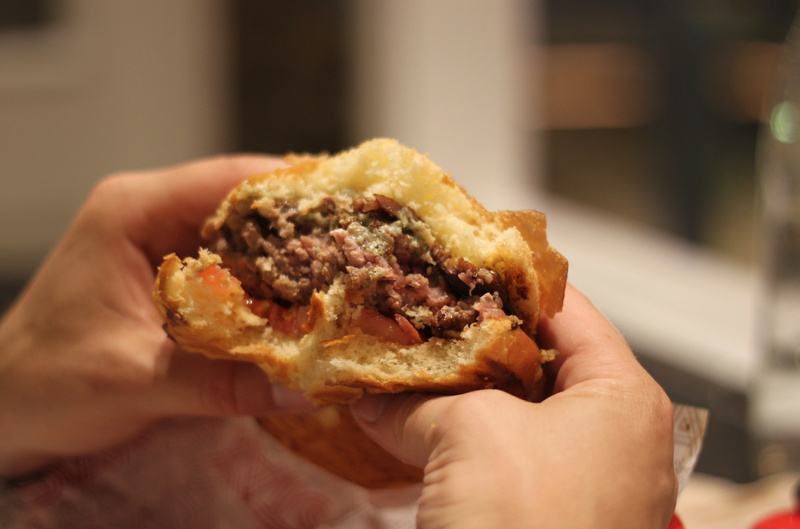 Conveniently, Bea Vo's Stax Diner had just started its soft launch, so we squeezed in there just before closing. 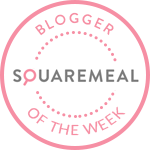 Bea Vo is best known for her ongoing Bea's of Bloomsbury success but she also built up quite a following with her weekend diner in the Maltby St Market area. Those still mourning the loss of that outpost should promptly make their way over to Kingly Court where Bea has introduced a little bit of 1960s charm in the form of Stax Diner. From weekend hangover brunch to late night sustenance, Stax has you covered at all times of the day. We arrived just as last orders were being taken, and ordered a round of burgers & fries, including The Big Stax (28 dry-aged Pedigreed Sussex Beef on Balthazar Brioche with Spicey Comeback Sauce, Maple Glazed Beef Bacon, Caramelized Onion and a choice of cheese for £10.95 - you can make it a Double or Triple Stax if you think that's not enough). Unexpected high demand on their first day of trading meant several tempting items weren't available, so a return trip is definitely in order. 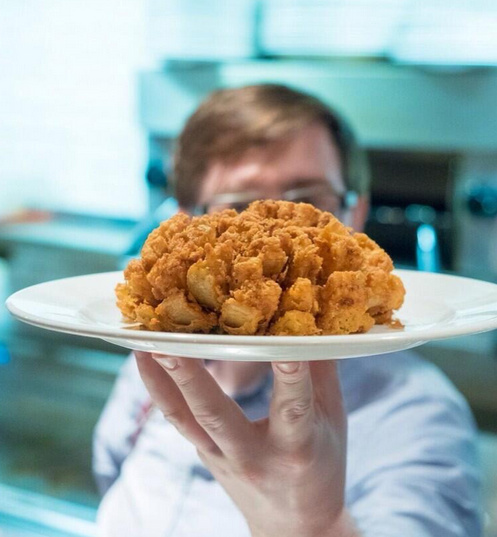 The Stax Po'Boy with cajun spiced popcorn shrimp on brioche and an eye catching Cajun Onion Blossom are on my to-eat list, along with The Dough-Bro - a brownie-doughnut hybrid for dessert. 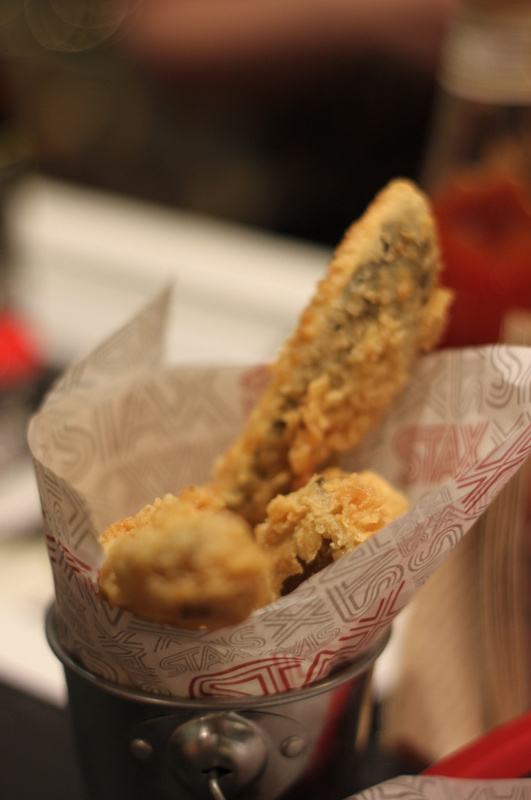 We did manage to get hold of some superb battered pickles, and a tasty basket of apple poppyseed coleslaw to go with the "boardwalk" fries. 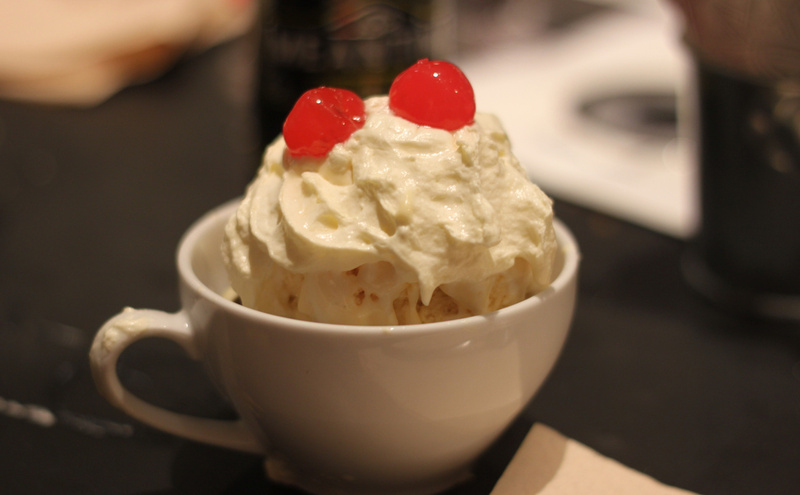 We left space for a couple of decadent Duffin Sundaes - Bea's famous buttermilk and nutmeg duffin (doughnut vs muffin) with French Vanilla Ice Cream, Fudge & Butterscotch Sauce, Whipped Cream and Cherries, cutely served in teacups. Starbucks have controversially recently trademarked "The Duffin" which Bea came up with, but it seems they have no plans to stop her selling them (Much ado about Duffin?). Otherwise she might have to start calling it a Muffnut, and noone wants that. As well as coming back for Onion Blossoms and some boozy Milkshakes / Ice Cream Floats, I also need to get along for a Stax brunch which is now up and running every Sat-Sun from 8am til 2pm. Stax Wild Blueberry Buttermilk Pancakes, Balthazar Brioche French Toast with Caramelized Bananas and Walnuts, and Buttermilk Marinated Fried Chicken and Waffles can all be washed down with bottomless Square Mile coffee. See you there! Saturday 14th June - Day 3 of the World Cup promised to be a cracker, not just because England vs Italy was on at 11pm, but on account of it also being World Gin Day. I had it all planned out - Ginstock would take us from 11am through to 5pm, then Colombia vs Greece and Uruguay vs Costa Rica would plug the six hour gap before the big match. But Hackney Council decided to throw a spanner in the works by refusing to grant Ginstock a license for the event. Bermondsey to the rescue - as usual. 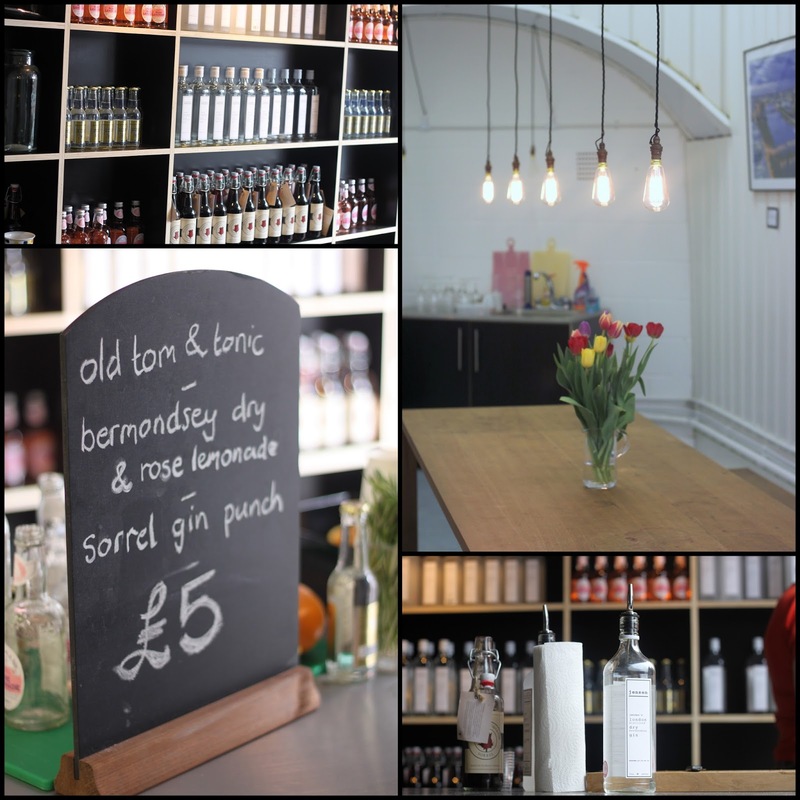 My trips to Bermondsey have been fairly well documented (read more on breweries / local food & drink / Bermondsey Street), but a special mention on this occasion must go to the Jensen Gin distillery (just off Maltby Street Market) which has finally started selling cocktails alongside bottles of their gin (on Saturdays only). 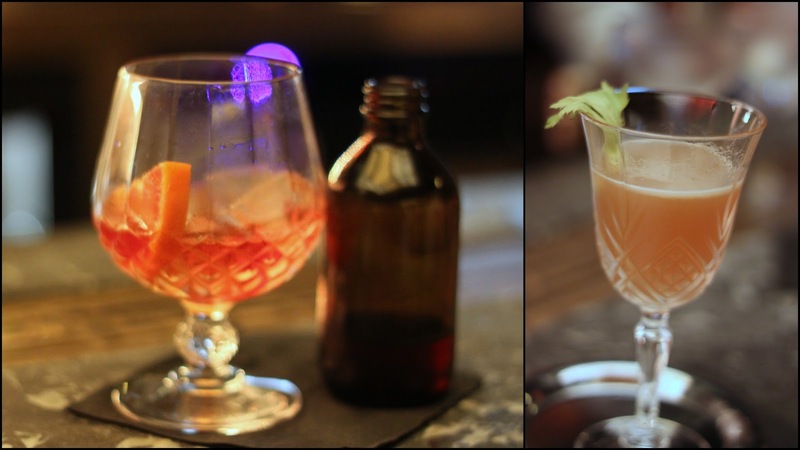 £5 will get you an Old Tom & Tonic, a Bermondsey Dry with Rose Lemonade, or a Sorrel Gin Punch - all generous portions made with top quality booze. We dropped by twice in the spirit of World Gin Day, drawn back in by the nutty two women running the bar. Food vendors will apparently be setting up shop throughout July and August, though there's enough to choose from already a stone's throw way. Randy's Wing Bar have just announced that they will be there this month. 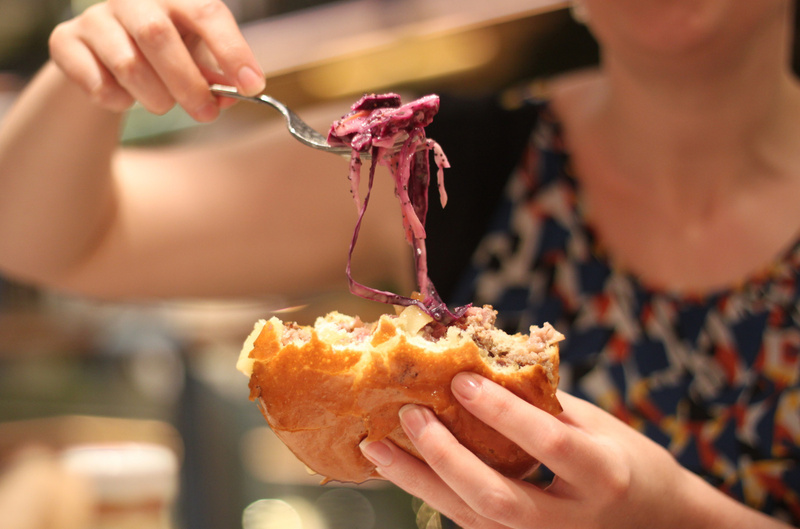 I weaved my way throw the crowds to get a messy pulled pork burger from African Volcano and poked my head in to the new St.John Bakery Room which has just opened on Ropewalk. Drop by on Sat/Sun 10am-6pm for light meals, breads, pastries and wines. "A little research shows that these two London staples have always been close in the hearts of Londoners. 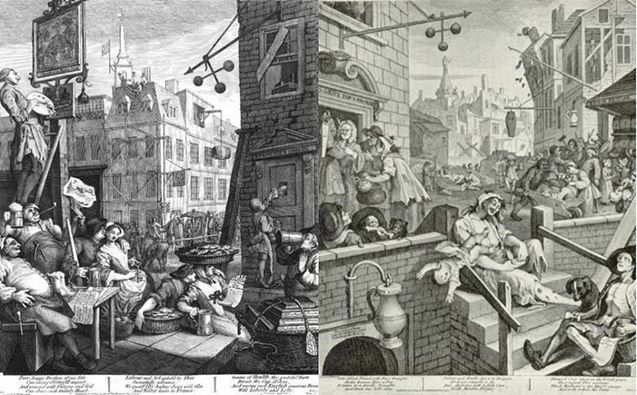 Exemplified by Beer Street & Gin Lane by the great William Hogarth (below). Although a piece with an agenda aimed at pushing opinion away from mothers ruin in support of beer ('hurrah!') and to push support for the timely 1751 Gin Act that aimed at curbing Londoners' enthusiasm for the Juniper Juice. Well back in the day they actually did make a primitive cocktail which was a 1/2 pint of porter to one measure of gin. Known as a 'Dog's Nose'. We've also had an experiment and found that the smoked brown on ice with lime & Jensen's works like you wouldn't believe. We've named it 'Smokey Pigeon'. 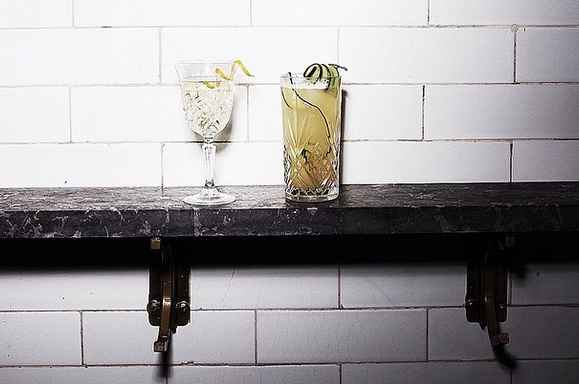 A short walk led us to 214 Bermondsey Street, an unmarked gin bar tucked away beneath AnticoItalian restaurant. I wrote about it a long time ago (see here), but I must revisit properly again soon as I was even more impressed this time around. Colombia vs Greece in the background was an added bonus, but the real star of the show was St. George's Terroir gin, equally at home in a Martini and a Tom Collins. They have a cracking daily 5-6pm happy hour with £4 double G&Ts and fantastic Sunday Special deals from 4-10.30pm including £5 cocktails. Colombia dispatched Greece (who didn't look like they would make it to the second round), and we went in search of Bermondsey Arts Club, a new cocktail bar in an old public toilet on the corner of Bermondsey Street and Tower Bridge Road. Bermondsey Arts Club - Toilets or Cocktail Bar? The former public conveniences are open 6pm-2am Tuesday-Saturday. Unlike the tiny Attendant Cafe in Goodge Street with urinals for cubicles, Bermondsey Arts Club has gone for a traditional classy cocktail bar look, with a striking bar that grabs your attention on the way in, and décor suitable for the live jazz that takes place on Wednesdays. The Mary Rose (atomised rosemary gin, blue cheese olives - £9), Jimadors Treat (Ocho Tequila, Manzana Verde, Pressed Apple - £7.50), and Old Negroni (Antica Formula, Punt-e-Mes, Campari, Beefeater - £9) all come highly recommended. However, the standout drink was an off-menu bespoke creation by Milo which he named "Original Sin". It involved smokey tequila, Cynar and a lot of celery, and was up there with the wonderful agave cocktails from a few weeks before at El Nivel. Bermondsey Arts Club is much more than a quirky bar in a toilet, and is very well placed on a stretch of Tower Bridge Road that is no doubt in the process of gentrification. I'm sure we will see several more lavatory conversions this year (railway arches are so 2013) starting with WC (which stands for wine & charcuterie - #LooLols) opening up in Clapham Common's 100 year old disused toilet block next week. Uruguay vs Costa Rica beckoned, so we skipped back up Bermondsey Street to the Globe House events space which has been transformed into a popup World Cup Bar for the duration of the tournament. The upstairs "Home Bar" has a beer from every competing country (Flying Dog & Little Creatures IPA are your best options). Meanwhile, the downstairs "Away Bar" has been left in the capable hands of Jim Wrigley of Made in the Shade - apparently they will be taking over the space permanently when the World Cup ends! The downstairs tables have a minimum spend which you will probably reach with relative ease if you take a big enough group. Sustenance from Pizza Lupa and a couple of Jim's "Half Time Bloody Orange Sanguino" tequila slushies will get you most of the way. Or go all out and order the £70 Jules Rimet Gleaming Bowl for 10 people! Both floors are wonderfully airy, even when full of sweaty England fans, and the indoor fauna almost makes up for not being in Rio (not quite). The atmosphere was superb for both games, even though England lost. Little did we know, the Costa Rica victory over Uruguay was no fluke! I still haven't found a Costa Rican hangout in London - hopefully something will turn up before 2018 unless anyone has any tips? If you aren't sure who to support, Globe House will be one of the busiest and buzziest impartial venues for the last six matches - make sure you book ahead though! Sun 15th June France vs Honduras at Le Pot Lyonnais in Battersea. An authentic but quiet French crowd were present in this bar and restaurant. Next time I will go for Zetland Arms or the French Insitute, both in South Kensington. Tue June 17th Brazil vs Mexico // Netherlands vs Mexico at Mestizo in Warren Street. Probably the standout venue of this World Cup. The Mexican fans are a bunch of nutters, and bargain basement tacos, tequila slushies and buckets of beer, plus a DJ, a bloke with a whistle, face paint and stickers led to the most incredible atmosphere. If you ever go along to match, make sure you learn the words to Cielito Lindo and shout "Puto" (effectively meaning "queer"!) whenever the opposing team has a dead ball situation. 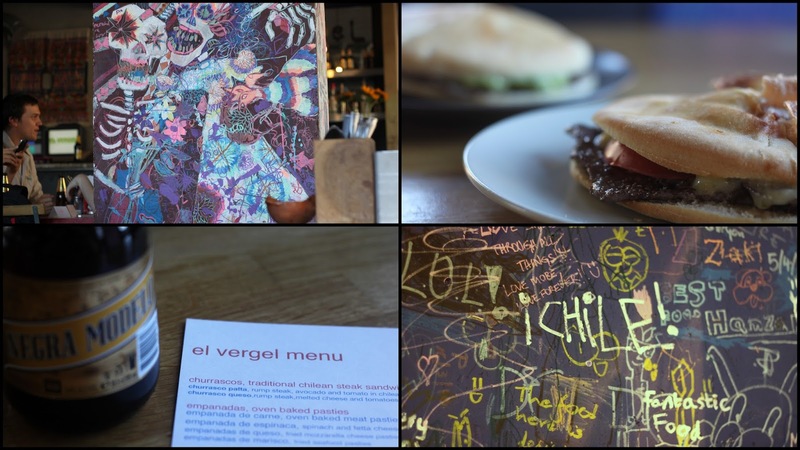 "AY AY AY AY, CANTA Y NO LLORES..."
Wed June 18th Spain vs Chile // Sat June 28th Brazil vs Chile at El Vergel in Borough - a fun, sit-down affair with tasty churasscos (steak sandwiches) and empanadas (pasties) washed down with Negra Modelos. The crowd could have been rowdier, but we did manage to learn a Chile chant or two. "CHI CHI CHI, LE LE LE, VIVA CHILE!" Sat 21st June Germany vs Ghana at the new Bierschenke in London Wall. Great atmosphere, loads of Germans - get there early and order a giant sausage platter! Kudos to the lone Ghana fan in the corner. They are still in the tournament and it will be rammed for their semi-final with Brazil! Read more here. Wed 25th June Argentina vs Nigeria at Moo Cantina in Pimlico. This place has been absolutely packed whenever I have walked past. Get there incredibly early for their semi-final against Netherlands this week. I haven't got any of the songs down yet, but they are a fun, noisy bunch so expect to come out with no voice left. Sun July 1st USA vs Belgium at Old King's Head in London Bridge. A late contender for best atmosphere of the tournament. Tonnes of fans (organised by American Outlaws supporters group) comandeered the pub for every USA game, and their main chant is one of the most addictive out there. "I BELIEVE THAT WE WILL WIN!" I have been saving De Hems (for Netherlands) and Floripa / Guanabara (for Brazil) who are both still in the tournament. On my wishlist for next time is a trip to La Bodeguita in Elephant & Castle to hang out with the Colombian fans. Bizarrely, I ended up watching their last match in a small square in Venice, but that's a story for another time. I warned you it would be football heavy. Don't worry, it will be over in 6 days.